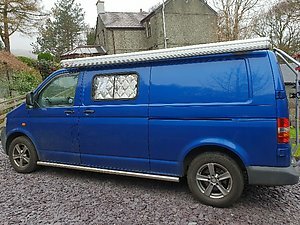 Super comfy and genuinely reliable campervan that'll take you to some amazing adventures! 2.5l diesel, long wheel base, 6 gears, T32 (but professionally tuned to about 150bhp and to give better economy, approx 40mpg). If you're looking for a T5 this is THE model to get! Nov 2007 (57 plate) 2 owners, I bought it when it was less than a year old. 4 nearly new winter tyres fitted, plus sold with 4 very good summer tyres. Van rated alloy wheels with 2 lock nuts on each. Side window and full set of blackout thermal screens. 130,000 miles, average for age, these miles are 95% motorway cruising, plus these 2.5l T5s will go round the clock 2 or 3 times without issue. Sony sound system with remote control and 6 speakers, plus sub woofer. Super comfy king size bed that folds out or stows away to a really comfy seating area. Fold away table, sold with camping stove and Calor gas, plus cooler box. Boot/garage space built to house 2 bikes or all your climbing gear so it doesn't have to mess up the living area. 2 custom sized storage boxes under the bed. Shelves behind drivers seat and book shelf above bed. Lots more photos available or come see the van in Llanberis, you won't be disappointed! Van looks great, can you send me some pictures? Is it insulated very well? I'm looking at using it for winter trips. Thanks, yes, it's a great van! I'll send you some more pics. The van is insulated throughout, including the floor, walls, ceiling and doors. The diesel heater is also super toasty, it warms the van in no time, has a 7 day timer and uses very little diesel.